Specifically, on the reading you need to do when you’re a writer. Practise your reading before you turn up at the place of the reading. Practise it more than once. More than twice. Go up to five times (after that you’ll freak yourself out). Time it – the average reading should go for between 3-5 minutes coz that’s generally all the attention span the audience can bear (unless you’re an awesome storyteller who can hold people’s hearts and minds and ears in the palm of your hand). This is entirely personal, but my rule is don’t drink before you read. You might think it soothes your nerves, coats your tongue with silver, but a nervous person tends to be a gulper and before you know it, you’ve had two or three, your cheeks are red and you’re laughing uncontrollably, falling over your own feet and impaling yourself on the mic stand (if you’re luck – then you can be carted off to hospital and avoid the reading). Trust me, no one will talk about the awesome reading. 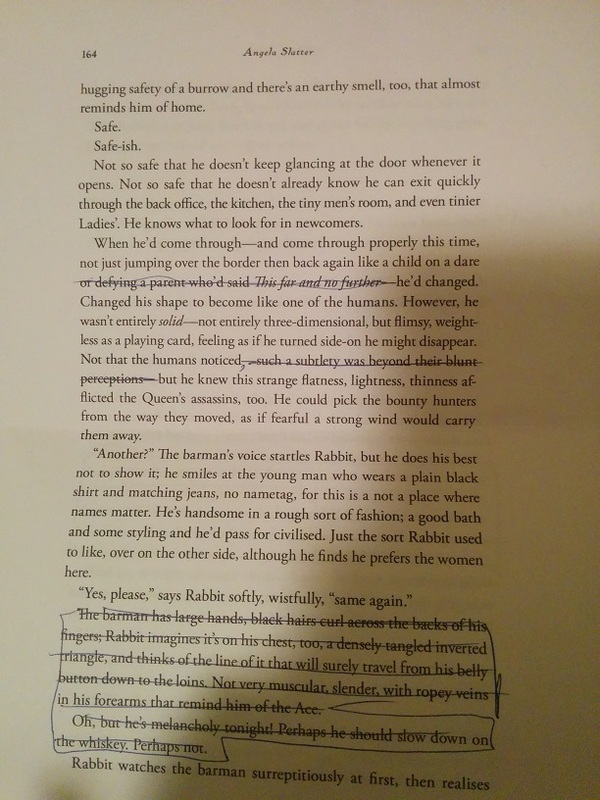 So, to illustrate the flensing technique, here are the first two pages of the story I read at Muse in Canberra last Thursday night before Conflux started. 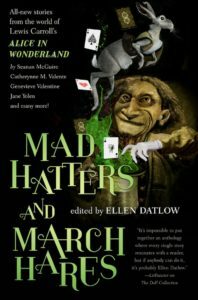 Kaaron Warren, Ellen Datlow and I all went along and chatted to a full house about Alice in Wonderful, and Ellen’s new anthology Mad Hatters and March Hares, in which Kaaron and I both have stories. You can see what I took out and what I left in. 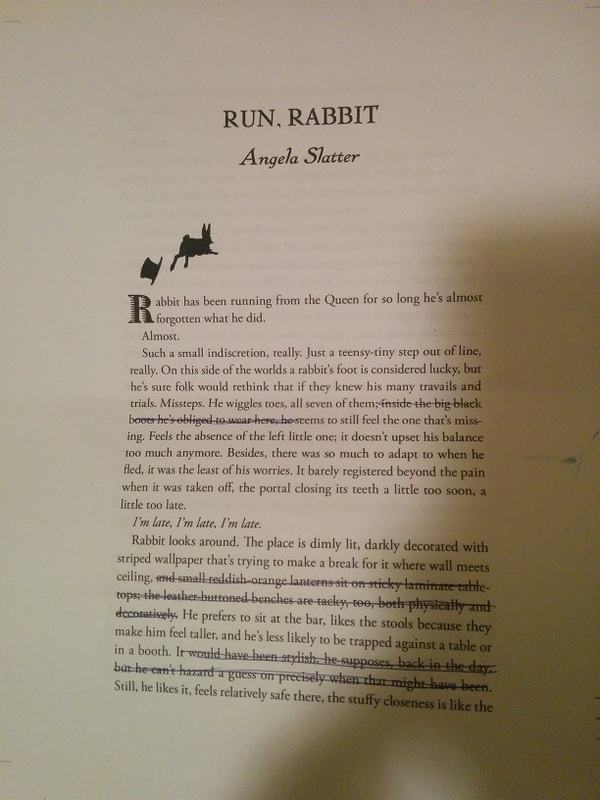 This entry was posted in News, On Writing: General and tagged Alice in Wonderful, Canberra, conflux, ellen datlow, Jeffrey Ford, kaaron warren, Mad Hatters and March Hares, Muse, tor. Bookmark the permalink. Thanks for the tips, Angela (and the peek at your story). I might also add, at least for me, to avoid listening to audio books beforehand to try and channel a pro’s burnished style of reading. It resulted in me speaking with a funky accent. As if snarfing air and having my tongue stick to the roof of my mouth were not mortifying enough : P I guess this is a classic case of something appearing to be quite natural being anything but! Jayne, it’s very much a case of making it look like a swan gliding effortlessly on the lake surface when beneath it’s all mad paddling!